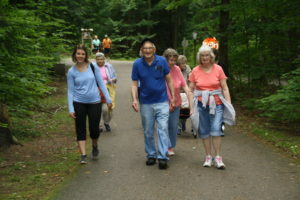 The OCCOA’s Walk Michigan adult walking program encourages area older adults to get outside and enjoy healthy exercise while exploring several parks and trails in Otsego County. The walkers meet on Mondays, Wednesdays, and Fridays between 10:30 and 11:30 a.m. for eight weeks. OCCOA’s Healthy Aging Program Coordinator Amanda Dobrzelewski leads the Walk Michigan hike at Aspen Park. Walk Michigan is a partnership with the Otsego County Parks and Recreation Department, Otsego County Bus System, and Alpine Taxi LLC, and limited transportation is available for walkers. See the full program flyer below for locations and other details.